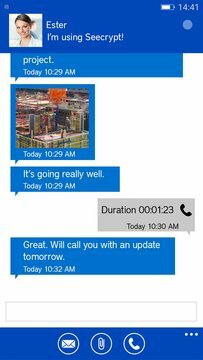 Seecrypt is the next generation of secure communications for Windows Phone 8. A user-friendly and intuitive application that provides secure communication and peace of mind. Seecrypt allows you to make and receive, secure voice calls send and receive encrypted text messages and attachments between Seecrypt Mobile-enabled devices, anywhere in the world. Seecrypt removes the complexity of encrypted communication and operates over a broad spectrum of devices. 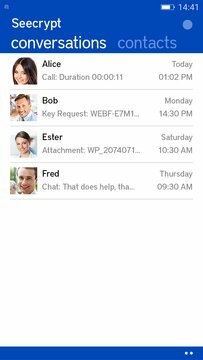 Featuring instant messaging features and enterprise business functionality – all wrapped in advanced security and encryption – it will be the choice for anyone requiring easy-to-use, secure communication. Seecrypt is using a unique double-layer AES 256 & RC4 384 end-to-end crypto scheme, with new ephemeral session keys for each call and message, that affords all individuals and corporations extremely strong encrypted communication. *Application may not be used for emergency calling.